Hello! Today I'm back with another 26 Great Nail Art Idea's post. Today's prompt is 'Black Base'. It took me forever to figure out what to do for this one, but here's what I came up with in the end! I've seen a lot of festive manis creeping into people's pages recently, and I couldn't help but join in. Read on for more info! I started with a base of Pretty Serious Cosmetics 'Absence' (swatched here). 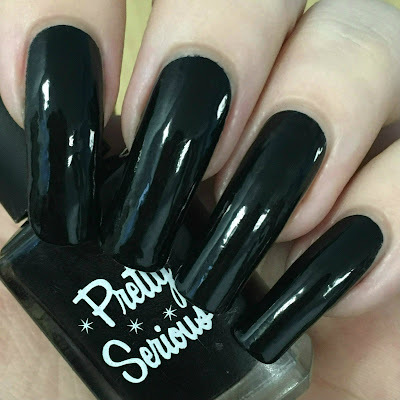 This a perfect one coater and has been my go to black for the last several months. It even stamps! Below is one coat and topcoat - apologies for the old picture with much longer nails. 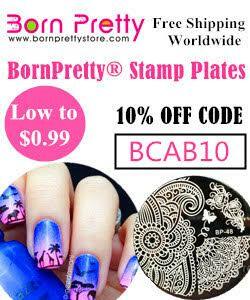 For my stamping, I used my Born Pretty clear stamper and Esmaltes Da Kelly neon green stamping polish 'Bruce'. I stamped the tree pattern from MoYou London festive plate 03 onto my index, ring and pinky nails, and one of the singular trees from Ejiubas plate EJB-03 onto my middle nail. I then added some lights to the tree on my middle nail using Nails Inc 'Seven Dials' (yellow), Barry M gelly 'Passion Fruit' (orange), and a small dotting tool. I also added a silver star stud to the top of the tree before finishing with a coat of quick dry topcoat. What do you think? Without the prompt, I never would have thought of using a black base for this mani - and it really works! 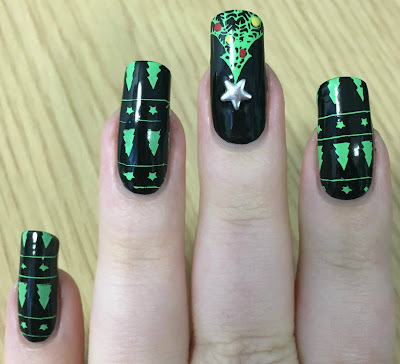 It might be just a little bit too early for Christmassy nails, so I'll try and hold back before doing anymore (although I can't promise I'll wait long!). I'll be back with another 26 Great Nail Art Ideas post in two weeks. Yay for Christmas manis! I can't wait to start doing some myself! I really like the single tree stamp! I'm not ready for Christmas manis yet, but this is a good start for the season! It's so sweatery. The star stud is a nice touch! Ahh I can't believe Christmas season is sneaking up already! I'm excited to get started, too. I love the bright green trees on your mani! Super fun! 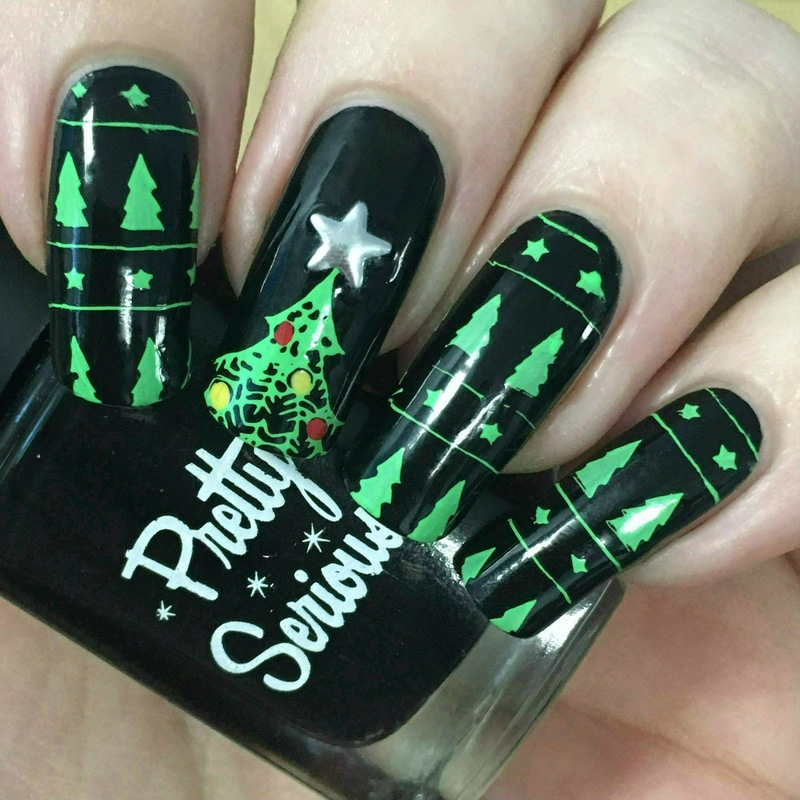 I like your mani, but it's just too early for me to start thinking of christmas! first xmas mani! I will wait for December!